Seattle University provides a distinctive learning experience in a captivating city where expert faculty in the nearly 500-year-old Jesuit tradition of education excellence ensure the holistic formation of every student. Our location in the heart of Seattle guarantees students an urban education that includes access to internships; internationally recognized research, business, and government leaders; and a wealth of cultural and social opportunities that make a well-rounded college graduate. Seattle University affords a comprehensive residential experience in a lush, beautiful campus. Designated an Official Backyard Sanctuary and nationally recognized for its recycling and environmentally sensitive practices, the University is also within walking distance to the downtown business center. The undergraduate student body totals 4,780 and includes representatives from 51 states and territories and 90 nations. At Seattle University, you will find a classroom-oriented institution with impressive resources. The average class size is 19, but personal education means more than the number of students in a class. Professors here want to help you—not just so you know the right answer but so you can ask your own questions and look for your own answers. The emphasis on holistic education means you’ll be challenged inside the classroom and out. The University is consistently listed by U.S. News & World Report as one of the best comprehensive universities in the western United States, and it is also ranked nationally among Engineering programs not offering doctoral degrees. Students learn by doing good for their community. In 2012, 2013, and 2014, Seattle University was recognized by the White House as a leader in community service and volunteerism. All professional programs have met the demanding standards for full professional accreditation, including the Association to Advance Collegiate Schools of Business (AACSB International), the Accreditation Board for Engineering and Technology (ABET), the Commission on Collegiate Nursing Education, the American Chemical Society, and the Commission on Accreditation of Allied Health Education Programs. Seattle University offers 65 undergraduate degree programs through the College of Arts and Sciences, the Albers School of Business and Economics, Matteo Ricci College, the College of Nursing, and the College of Science and Engineering. Distinctive undergraduate programs include majors in Criminal Justice, Diagnostic Ultrasound, Digital Design, Environmental Engineering, and Film Studies. All students build strong critical-thinking and writing skills through the University’s dynamic Core Curriculum. The Jesuit educational ethos of social justice, global awareness, and diversity underlies all academic programs. A priority is placed on educating students for leadership and service. Approximately 80% of Seattle U students do service in the surrounding community. A noteworthy number of students travel annually to places such as India, Belize, or Nicaragua on service trips, and around 550 students study abroad in some 55 countries each year. The University’s location is in a setting of great natural beauty. Seattle, Washington, is situated between Puget Sound and Lake Washington and commands breathtaking views of the surrounding Cascade and Olympic Mountains. It’s a city noted for its rich ethnic diversity, social and environmental sensitivity, progressiveness, and a fantastic music and arts community. A balance is offered between myriad cultural opportunities and an extensive range of recreational pursuits. The city is known for its cultural scene and spends among the highest per capita in the United States on books—accounting for a large and diverse selection of bookstores. Seattle is simultaneously cosmopolitan, active, and fun—and so is the Seattle University student body. On campus, there are more than 130 clubs, organizations, and honor societies that provide leadership development and study-break activities. 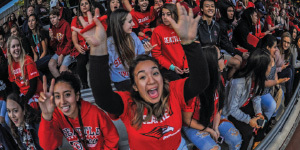 Popular clubs include Hui O’Nani Hawai’i Club, Dance Marathon, Student Government of Seattle University (SGSU), Redzone, Outdoor Adventure and Recreation, and many more. Seattle University has 20 intercollegiate teams and is in NCAA Division I as a member of the Western Athletic Conference (WAC). Students can engage in friendly competition through a variety of intramural and club sport offerings, including dodgeball, flag football, kickball, soccer, and volleyball. Four residence halls and two on-campus apartment complexes house 2,000 students, and undergraduate housing is available all four years. Approximately 93% of freshmen and sophomores live on campus. 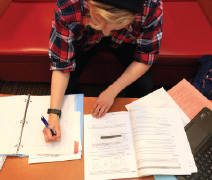 Extensive financial aid makes Seattle University affordable to students of all backgrounds. The University grants $75 million of its own funds in financial aid, with a total aid budget of $116 million. The average aid award to eligible first-year students in 2016 was roughly $28,000. Seattle University has a generous scholarship program designed to promote the values of Jesuit education. A wide variety of merit scholarships— ranging from $5,000–$22,000 a year—are available in addition to need-based aid. Freshman applicants should apply by January 15 to be fully eligible for both admission and scholarship opportunities. Applicants are encouraged to apply by January 15. An official secondary school transcript, ACT or SAT scores, two letters of recommendation, an essay or personal statement, and a completed application are required. The middle 50% of freshmen typically have average GPAs of 3.4–3.9 in demanding college preparatory programs.